For audio rental equipment we set up two QSC K10 Powered Speakers, one Shure Combo Wireless Microphone kit as well as a Shure QLXD4 Distro Wireless Microphone pack which included one Lavalier and three handheld microphones, that were on mic stands. We utilized both our Mackie 1402-VLZ4 14 Channel Mixer and Mackie Pro FX12 12 Channel Mixer for the webcast. We also provided Headphones for monitoring the webcast. 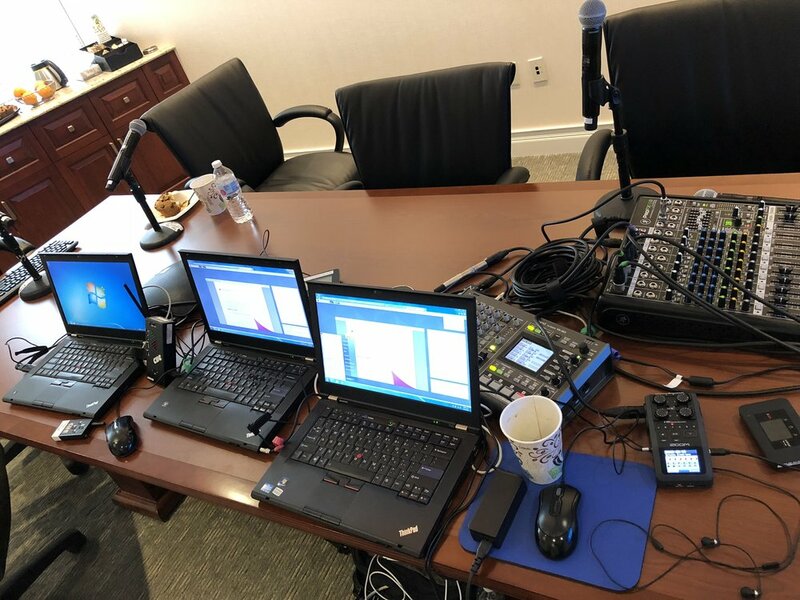 For video rental equipment we provided our Zoom H6 Handy Recorder, a Roland VR-3EX Video Mixer/Switcher, a DSAN PerfectCue Wireless Remote (light and sound system signaling) and a Pix 240. We also sent a two AV techs, one audio tech and one webcast tech, to ensure the webcast ran smoothly.